"Netflix gives ladies wrestling a go. " Netflix has given a 10-episode order to G.L.O.W., an all-new comedy series helmed by Jenji Kohan, the creator/producer/showrunner behind Showtime’s Weeds and Netflix’s Orange is the New Black. Kohan will serve as executive producer for the series, which is set in the world of women’s professional wrestling during the 1980s. According to reports, Kohan’s G.L.O.W. series is directly inspired by the real-life female troupe of the same name, which stood for Gorgeous Ladies of Wrestling. 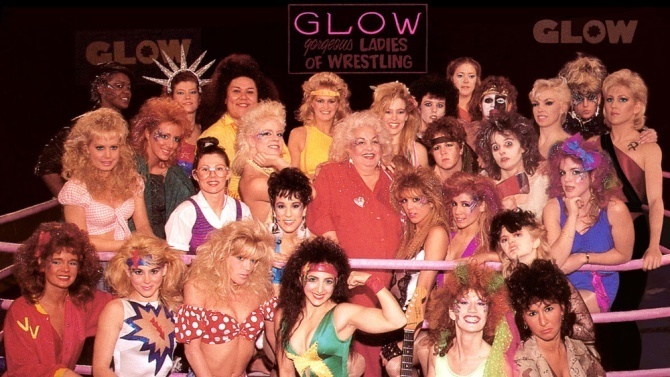 The series will apparently use as source material a 2011 documentary entitled GLOW: The Story of the Gorgeous Ladies of Wrestling. The protagonist of the fictionalized G.L.O.W. series is an out-of-work actress who finds her last shot in living out her dreams in the form of a weekly series about female wrestlers. Set in Los Angeles, G.L.O.W. promises to showcase “big hair and body slams,” which could result in quite the crossover hit for male and female audiences alike. G.L.O.W. was created by Liz Flahive (Homeland) and Carly Mensch (OINTB). Both Flahive and Mensch will serve as the series’ showrunners and will executive produce the show along with Kohan and OINTB co-executive producer Tara Herrmann. As of this writing, neither Netflix nor any of the principals have announced a premiere date or casting details for G.L.O.W., although that information is surely forthcoming. With G.L.O.W., Netflix and Kohan continue the fruitful relationship that has resulted in Orange is the New Black. The Emmy-winning show recently received a three-season renewal that will keep Kohan in the executive producer chair through season seven. Although Netflix is notoriously secretive when it comes to its viewership data, company executives recently revealed that OINTB is their most watched original series. At this rate, could we be far from a Kohan-verse at Netflix much in the same way that showrunner Shonda Rhimes has dominated prime-time programming at ABC? Only time will tell. Season four of Orange is the New Black is set to premiere on June 17. You can read reviews of the upcoming OINTB season on Entertainment Fuse!